On the water at Mercury Marina , Hamble with a new owner of a Falkland Premier 500.The boat is being delivered to it's moorings ! Falkland Premier Day Cruiser . but with a little more comfort and class . 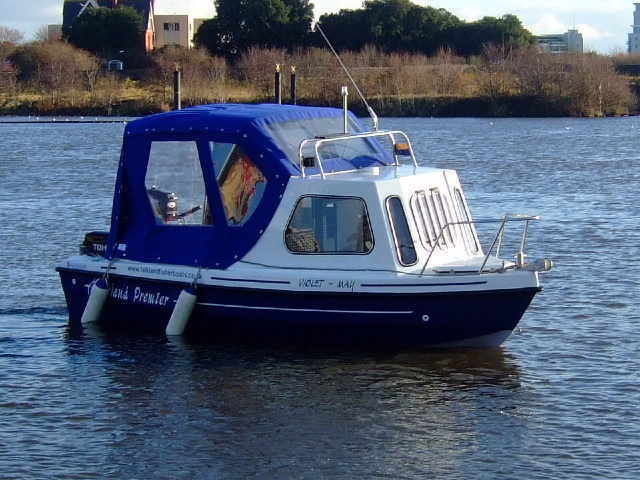 Ideal for day cruising on salt or fresh water for all the family and still with loads of space for fishing or just relaxing and unwinding. This one has a full pram cover which can be reduced to a flying bridge in seconds by simply unzipping ! Moored in Cardiff Bay , a Premier 500 with a flybridge. 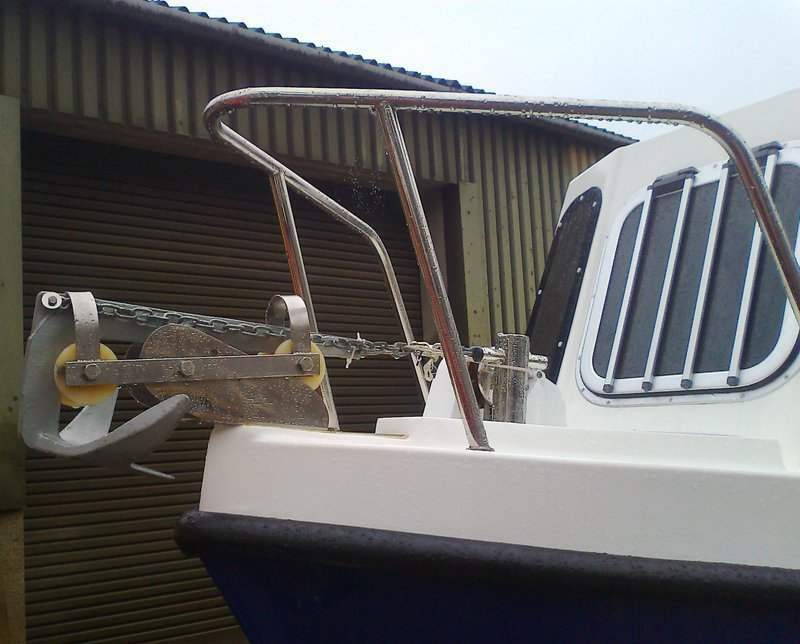 This is a great accessory to really enhance the look and practicality of your boat. 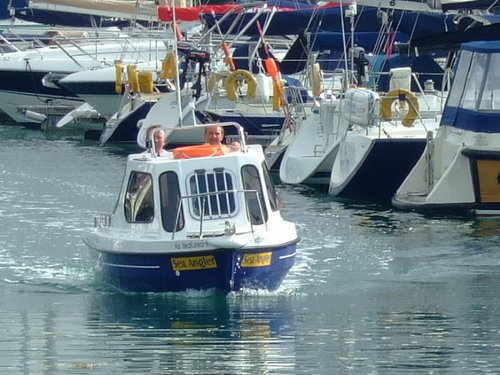 This boat was powered by a Tohatsu 40hp 2 - stroke and pushed it along at approx 20knots ! -ideal ! The spare engine is a 5hp Tohatsu 4-stroke, very quiet and very fuel efficient. 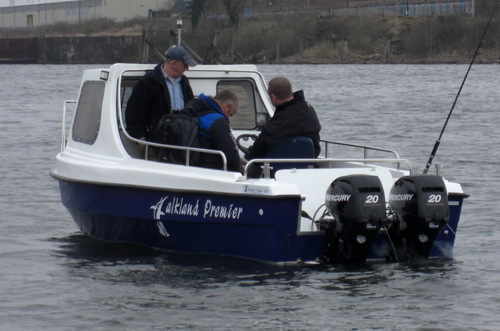 Falkland Premier, without the pram / flybridge cover, with twin 20 hp mercury outboards ,three adults and a load of fishing gear on board ! This boat sit's really high in the water even with twin engines ! 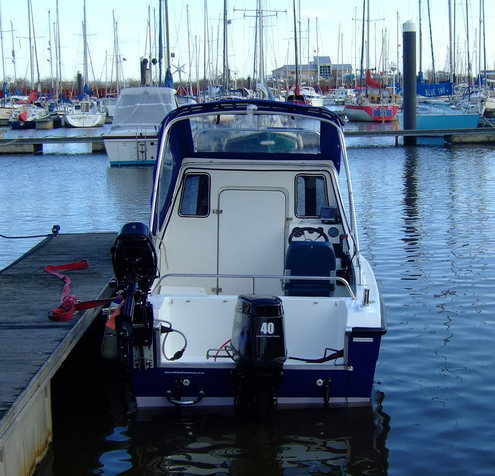 The shallow draft is ideal for going into estuaries or canals without fear of grounding ! This also makes the Premier ideal for inland waterways, cruising along rivers and where depth is at a premium, perfect for just relaxing on and unwinding ; perhaps mooring by one of the many bankside pubs and restaurants to be found throughout the inland waterway system! 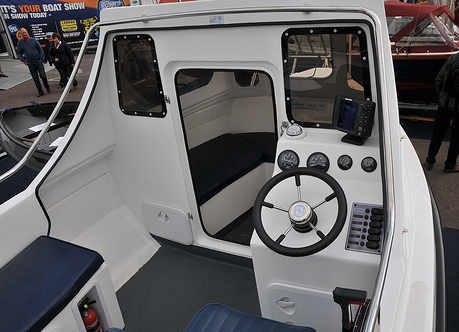 Watertight Lockable Cuddy which can be fully lined if reqd ,with a removeable door .This, allied with windows in the Baulkhead, gives excellent vision while at the helm and easy access. View inside the cuddy .The one piece moulding incorporates a pair of lockable lockers. 1 port and 1 starboard. The cockpit includes a cushion set as another standard feature. There is a 12v power point,located behind the console .This is ideal for a kettle, fridge etc ! 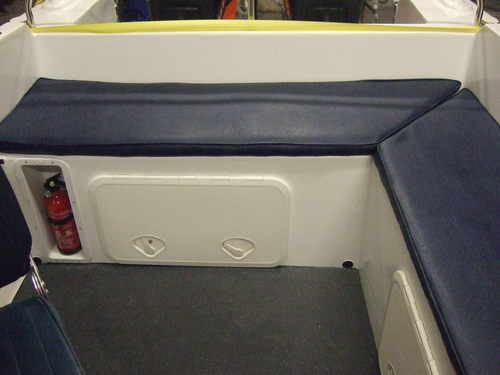 Rear seat and port side seat incorporating two large lockable lockers and fire extinguisher . In the rear locker , there's plenty of room for your fuel tanks , ropes etc without sacrificing quality storage space . A fully automated bilge pump is fitted as standard in a purpose built sump as is a non slip floor. A Removeable Table is a lovely addition and simply enhances what a Falkland Premier is all about. requirements and ready for the water . A 12V Anchor Winch is an extra well worth considering ! 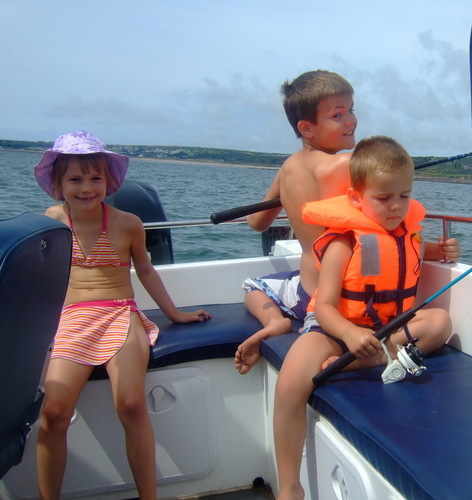 A Falkland Premier 500 really is a seaworthy boat the whole family can enjoy ! 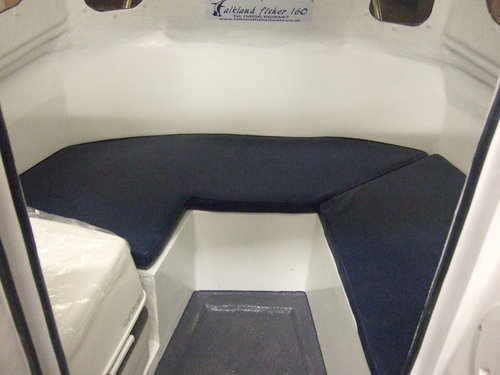 Falkland Premier Day Cruisers come with a 3 yr Hull & 1 yr Deck Structural Warranty. 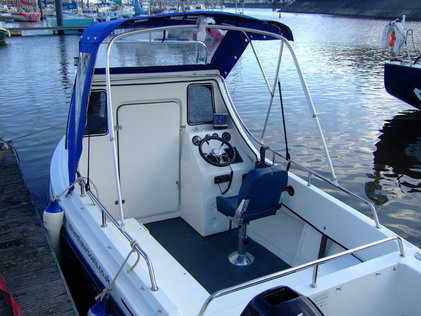 BOAT £9,990 incl Vat For a Limited Time Only ! 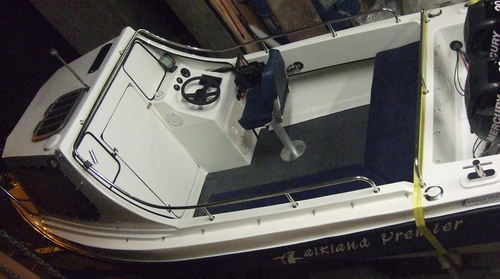 Our boats can be customised to suit all your requirements . This customer required a portable toilet fitted port side and a lined cabin !